What does slow fashion really look like facing the everyday realities of time, money and life that gets in the way? I have looked at my numbers for 2017: what I bought, what I made, how much I spent, how thoughtfully I purchased, the mistakes, the successes. In short, all the nitty-gritty details of an honest, imperfect attempt at making better clothes decisions. Of those 20 new additions, 2 were bought second hand. How many of the new items were a success? 14 of the new additions were a success. 2 were okay, but not fantastic. 14 out of 20 makes a success rate of 70%. But what about the wardrobe flops? Looking back at the wardrobe failures, two were due to the trial and error of learning. The edging on the jersey tops I sewed curled after the first wash. That is okay. I want to make my own clothes and keep pushing my skill set, and mistakes are part of that process (however annoying it is to admit it). One was due to bad decision making. The second hand pair of hiking trousers just don’t fit and I should have faced up to that before I bought them. I could take out the waistband, but I might as well sit it out for a while and see what my body looks like in a year or so. One was an unforeseen flop. The zero waste jacket didn’t end up being worn. I think, because I sewed it while at the beginning of my pregnancy and I still feel a wave nausea each time I look at it. Weird, I know. I’ll bring it back out when I’m ready. Were the items sustainably sourced? 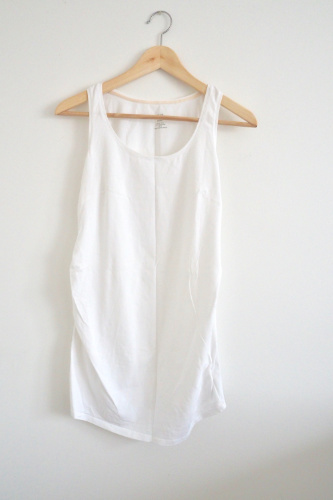 Dress from Gudrun Sjöden in organic cotton, but produced under unknown working conditions. Winter boots from Ecco. A quality-focused European brand who own most of their supply chain, though I know nothing about the labour and materials that went into these boots. 1 pair of trainers, not only produced under unknown working conditions but with a sole that probably won’t decompose for another 1,000 years. How many repairs and refashions? I spent 11,100 NOK on clothes and shoes, bought, handmade and repaired last year. That is about €1,155, £1,020 or $1,408 US. Ready-to-wear items (new and second hand) made up 60% of the total cost of clothes and shoes. Looking at the number of items per category, the handmade garments were cheaper in average than the ready-to-wear garments. This surprised me, because for most of the handmade items I deliberately tried to source my materials more thoughtfully. While, on the other hand, several of the ready-to-wear items were very cheap. With this in mind, I realise that making garments myself means quality, ethical fashion is within reach. I thought the cost of ethical fabric would make it unattainable, but really it is finding suitable fabric that is my main challenge. The most expensive handmade item last year was the blue Kalle shirt dress, which added up to 800 NOK (€83, £73, US $101) including pattern, ethically sourced fabric, shipping and taxes. I can live with that. I would rather reduce the number of items than skimp on the fabric. The repairs gave most value for money, though here the numbers are misleading. I only paid for one repair: the boots I took to the cobbler. For the rest I used materials I already had. How do you measure slow fashion success? I added more items and mended fewer than I would have wished. Another question just as relevant as the number of pieces added, is the number of pieces that went out. Where did they go: into storage, donated, thrown out, repurposed as fabric? I didn’t keep track of that. But there certainly were things that went out of my wardrobe last year. Ideally, all the new additions to my wardrobe last year should have been real wardrobe workhorses and they should all have come from sustainable sources. Ideally. Realistically, I am not there yet. As a second-time mum, my body has gone through big changes over the year and I am still waiting for it to settle into its new shape. As an adult and woman I am still figuring out how I like to dress. As a professional I am still finding my place. And as a maker I am still learning. This all takes some exploration, some trial and error, some time to hone in on. Slow fashion is not only about the amounts of clothing I have. It is as also about having the right clothes, for me and for my lifestyle. Do I feel comfortable in my clothes? Do I have clothes that work together? 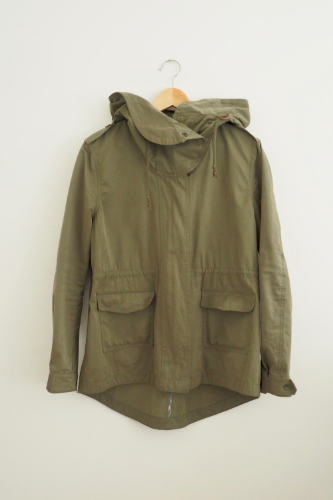 Do I have clothes I want to wear and will want to repair when they need it? 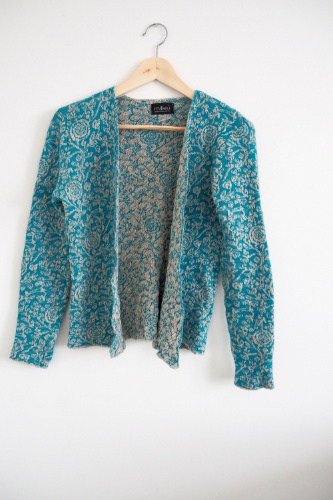 Adding and subtracting clothes in a thoughtful and more sustainable way is my goal. Getting there is a journey. Was 2017 a slow fashion year for me? Well, it kind of was and it wasn't. 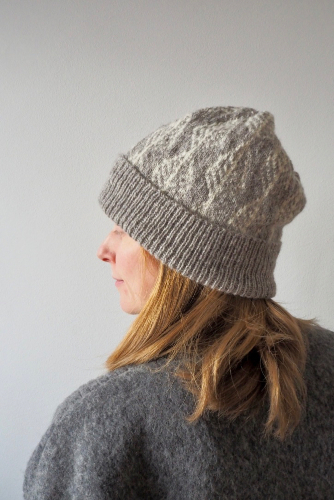 I am thinking: mend more, buy less and enjoy the process of making. More than seven months into my second pregnancy, the increasingly persistent question every morning is: what to wear? A slow fashion approach to pregnancy clothes is a challenge. A pregnant body changes fairly dramatically, but also relatively temporarily. It is easier than ever to make desperate last-minute purchases because you suddenly realise you have no trousers or tops – or whatever it may be – that actually fit. Slow, considered decisions don’t feel much use because in another few months your body will change again. For me, honing in on a pregnancy capsule, has been a continual process of trying to balance the desire of building a thoughtful, long-lasting wardrobe while also celebrating this period of change. Change that feels both beautiful and awkward, completely natural and utterly strange. I started loosely planning a Spring/Summer capsule with the aim of making it pregnancy friendly. I tidied away the pieces that would obviously not fit and made a list of things to make, like stretchy leggings and loose dresses. Some basic planning has been useful. Yet, several things on my making list I never got round to making. And things I thought I would wear a lot have been left untouched. No worries, I have managed fine anyway. Again, I am faced with the same lesson that I actually use less than I think I need. What items in your wardrobe will obviously not fit a growing tummy and that little extra pregnancy weight? Set these aside. What outfits can you now put together? Is there one or two key pieces you could add that would make it easier to create outfits from the clothes you already have? For instance, a pair of trousers with an elastic waistband to replace those tight fitting jeans or a pair of stretchy leggings to pair with tops and dresses. What clothes make you feel comfortable and nice? If you need new items, do you want to make or buy them? How much time and money will you have for that? 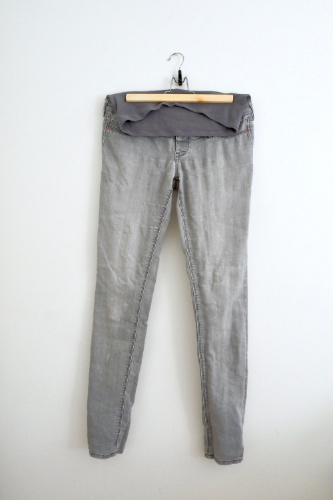 During my first pregnancy I bought two “mama” jeans and a top from a fast fashion store. However, none of them I really like. The black jeans feel too office-like, the grey jeans keep slipping down and the white top is only really useful those last two or three months when that pregnant tummy is really bulging. Both jeans have ripped and needed mending, by the way. Garments specifically designed for a pregnant body will only be used a few months. Yet, for those few months they may feel absolutely essential. In this light they align particularly well with the fast fashion mentality: low prices and cute designs trump considered investments in quality pieces that will last. I am certainly guilty here. So this time round I really wanted to avoid buying any more poor quality, cheap items that would only be worn for a relatively short period of time. And I have! But to be fair, I have also used these three pieces quite a bit. Refashion clothes you already own to make them pregnancy friendly. Take a look at the DIY maternity posts on the cotton + curls blog. How many pregnancy-specific items you need (or whether you need them at all) depends on how pregnancy friendly your ordinary clothes are. Stretchy, loose-fitting and comfortable pieces can carry you well through a pregnancy while also being useful later. In the top row above are some of the pieces I have sewn this year with the intention of making them useful both while pregnant and afterwards. A simple boxy dress, pattern from Stoff & Stil in a cotton jersey I had in my stash. 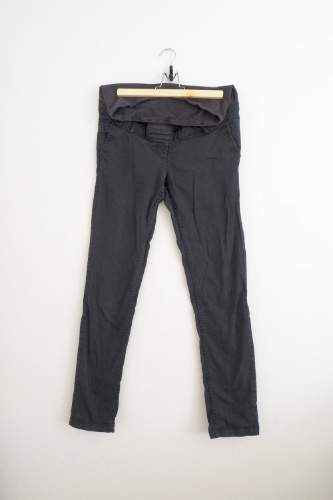 Leggings in organic jersey from Stoff & Stil, based on the Hudson pant pattern by True Bias tapered in for a snug fit. With the elastic waistband these are comfortable and stretchy enough to be worn low rise while pregnant and can be pulled further up later. A pair of woven Hudson pants from True Bias sewn in organic cotton from The Organic Textile Company. Again, with the comfortable elastic waistband. I made these two sizes larger than my usual size to accommodate for the non-stretch woven fabric, but I could definitely have gone up one more size for a more comfortable fit. In the bottom row of images are my three most worn pregnancy friendly store-bought pieces. 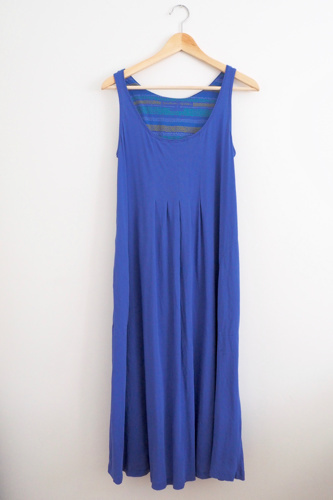 A tank dress which is an old fast fashion item from Cubus. The stretchy jersey fabric makes this a comfortable fit despite the growing bump. 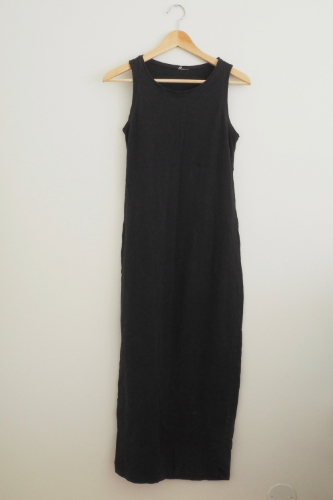 An organic cotton dress from Gudrun Sjødén. The loose fit over the tummy and hips makes this super comfortable and breezy to wear, while the semi fitted bust ensures I don't feel like a walking tent. An A-line jacket bought at a flee market for next to nothing. I can still zip this one up! 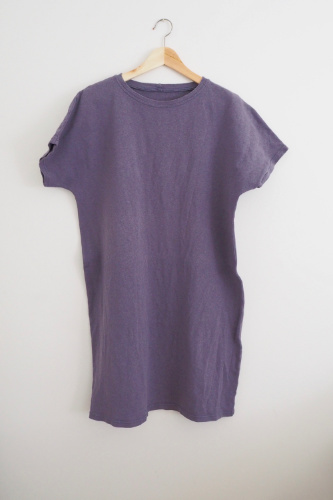 And if I want a more tapered look later I can always pull in the draw strings at the waist. Polishing your shoes regularly is perhaps one of the easiest and cheapest ways towards a more sustainable and long-lasting wardrobe. As a follow-up to the previous post on the wardrobe spring detox, today I want to share what I do with my winter boots once spring is in the air. I like to store winter coats and boots out of sight over the summer. I usually find it is worth the extra effort, just to be free from dusty boots and big down jackets cluttering the hall cupboard. I have read somewhere that you should polish your shoes every two weeks or so. I am not quite at that level yet, I’ll admit. But I have seen what a difference it makes polishing your boots once in a while. I particularly like to do this before putting my winter boots away over the summer. The leather holds much better over time and it makes it a lot nicer to get them out again in the autumn. Above and below are the ankle boots I have worn daily for three long winters. The left one is polished, the right is not. See any difference? For leather that is scratched or faded, I use a shoe cream that matches the colour of the boot. Traditional hard shoe polish works just as well. First, I wipe the boots clean with a damp cloth and let them dry. Then I use an old rag (or you could use a shoe brush) to work the shoe cream in. Finally, I brush them up with a soft shoe brush for shine (and here you could use an old sock or similar instead). For leather that is dry but not scratched, I use a clear leather balm instead. This gives the leather moisture and shine, and works as a protective layer against dirt and rain. Again, I wipe the boots clean first and use the sponge that came with the tub to work the balm in. After leaving them for a bit I wipe off any excess with a dry cloth. Easy-peasy. The whole job is done in about five minutes and immensely satisfying. I store the boots in shoe boxes or paper bags in our attic. Once I am ready to get them out again in the autumn it feels almost like opening a new box of shoes. That is, new old shoes: handsomely polished, but well-worn and guaranteed comfy. I am telling you, it is worth it.